Senior Royalty Nominations – Hopkins Raspberry Festival! The Hopkins Raspberry Festival is celebrating its 84th year of community involvement and tradition. The Hopkins Royalty Program is an integral part of this tradition. Each year we honor two area seniors to represent the Festival as Senior Royalty. We are currently accepting “recommendations” for your favorite senior(s). Are they outgoing, do they like parades, will they share their “Hopkins Experience” with our neighboring communities as well as within the city of Hopkins? If your “favorite senior” meets or beats these requirements, please let us know. From the recommendations, we will choose two Ambassadors and those names will be kept secret until the night of the Senior Ambassador Coronation during Dancing with the Seniors. Senior Ambassadors must be at least 55 years of age and live, work, volunteer, or worship in the city of Hopkins or Minnetonka, or the Hopkins School District. 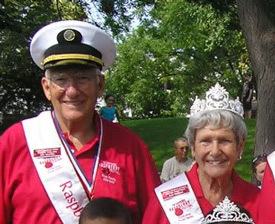 As part of the Hopkins Raspberry Festival Royal Family, the Senior Royalty travel to different communities promoting the great city of Hopkins. They will also attend and assist at Hopkins area events such as the Raspberry Parade, the Holiday Tree Lighting Ceremony, Empty Bowls, and the St. Patrick’s Day Parade. Other parades and community events are optional but always fun to attend.